This month we will introduce you to a fabulous new ‘Before & After’ series. Many of you have been eager to see more ‘Before & After’ posts and over the next few weeks we have quite a few lined up! We hope you enjoy this remodeled Hill Country home that was transformed into a modern classic. 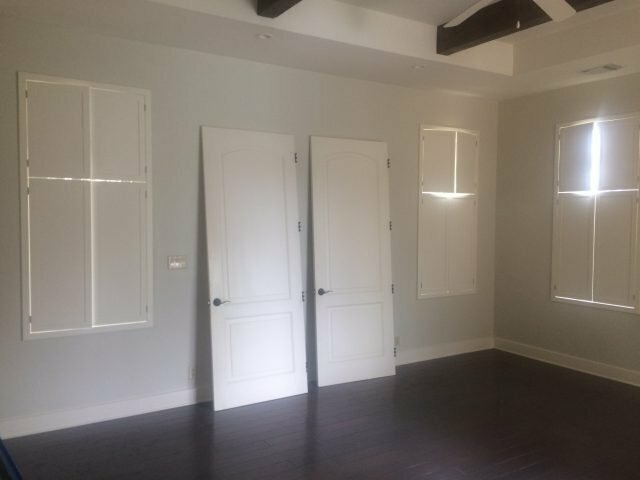 We worked on many of the home’s main spaces, including the family room, formal dining room, and breakfast/kitchen spaces. Today we will start with the master bedroom! We were brought into the project in the midst of renovations. 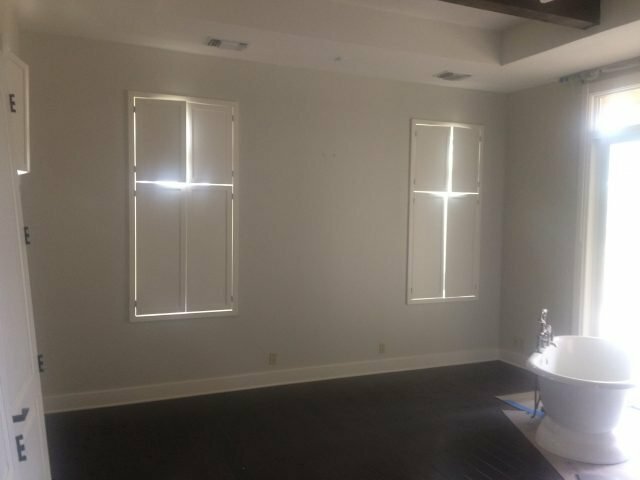 The master bedroom had so many windows! So much natural light poured into the space and there was such lush scenic views that surrounded the master suite. It was such a fun palette to start on. Here is another before glimpse into the bare bedroom. What a bright, happy and serene retreat! With so much natural light that pours into the bedroom from all the windows, the room lends itself to light and airy decor. We made sure to pick pieces that had an elegant and ethereal feel, and a mix of modern and traditional details. We also selected a light palette of primarily neutrals with blue and gold accents for a classic look. A slight wing-back frame on the neutral bed sits perfectly between a pair of windows. At the foot of the bed, a pair of x-benches with antique brass keeps the center of the room elegant and grounded. The rug beneath features a lovely tone-on-tone Greek key pattern, which adds a soft texture to the space. 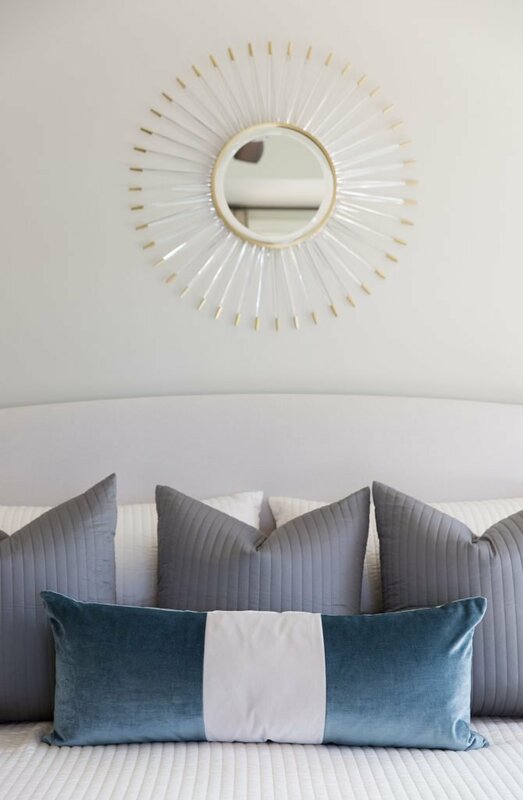 The starburst mirror above the bed adds a youthful, modern flair to the space. The mirror uses acrylic and brass accents for just the perfect amount of interest. 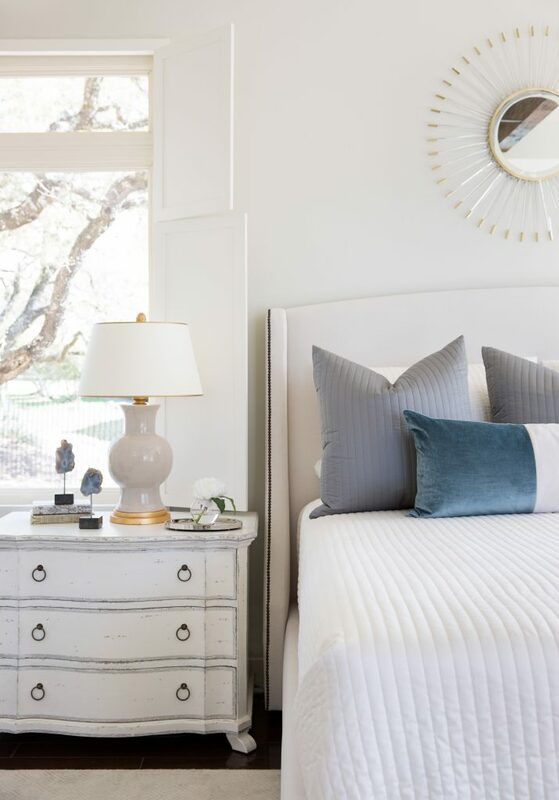 The custom bed pillows add a dash of blue to the otherwise all neutral space. The throw pillows can be updated based on the season and the space will still have the same dreamy feel. The traditional nightstands have an aged finish, which gives the bedroom some classic character. The carved front nightstands include rubbed metal hardware and silver striping. These modern details give the furniture even more interest. A pair of gold framed intaglios give the wall another point of interest and another appreciative nod to tradition. The gold frames bring in more of the gold that we thoughtfully sprinkled throughout the space. 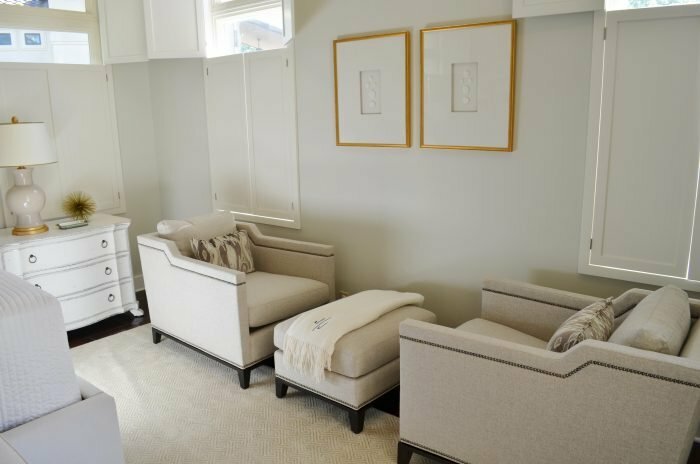 Cozy chairs and an ottoman not only give the homeowners additional seating, but another place to enjoy the scenic Hill Country views and their serene bedroom retreat. Next week we will introduce you to some of the main spaces! Stay tuned. Beautiful bedroom. Could you please post paint colors also? Hi Rhonda! Thank you! We selected the furnishings and decor in the project. We did not pick the paint color so we don’t have that information. Sorry about that!